I lost two of my chickens this week. One of them was a chick that I had raised from the day it hatched from the egg. The other was an older one that I bought fully grown last year. I lost the older one on Sunday night or Monday morning. On recollection I remember that it had been sitting in it’s hutch every time I looked at in on the hens. I thought it was just having a nice rest. Now I realise that it was possibly unable to move. I examined it and it shows signs of Marek’s Disease. It’s eyes were grey and it was very skinny despite food being available. I have lost chickens to Mareks in previous years, yet I had hoped that it was all behind me. On Tuesday, while I was feeding the chicks in their cage I noticed one would not go to the food as the others were. I examined it and noticed it had a lot of trouble walking due to it’s legs not working properly and one of it’s wings was sticking out at an angle. This is a very obvious sign of Marek’s Disease. I am not sure how it could have caught the disease, as they are not near the other chickens. I removed the sick chicken from the cage and placed it in an area by itself, with good shelter, food and water. Unfortunately the chook did not last the night and I found It dead the next morning. On Tuesday morning I was about to leave the house to go to work. It was still dark outside as the sun had not really broken the horizon. 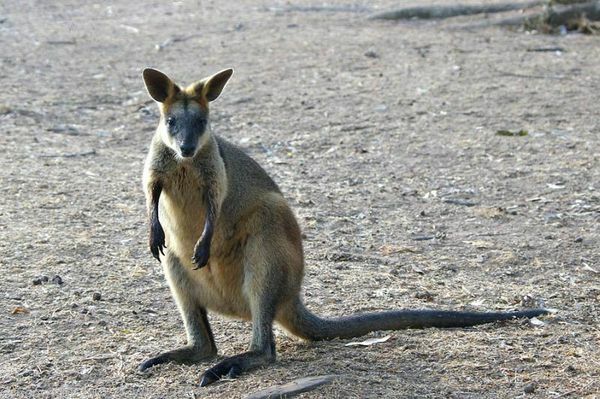 As I was leaving the house, leaving as quietly as I could, I encountered a Wallaby on my driveway. It was a very calm morning and the animal seemed happy just to watch me. I spoke to it calmly and it sat there looking at me as I exited the house. The Wallaby say watching me as I walked to my car and only hopped away when I started the vehicle. This incident reminded me that I live so close to a National Park that I may encounter animals, such as this Wallaby, who may have never seen a human in their life. It also reminded me of the beauty and tranquillity of nature.